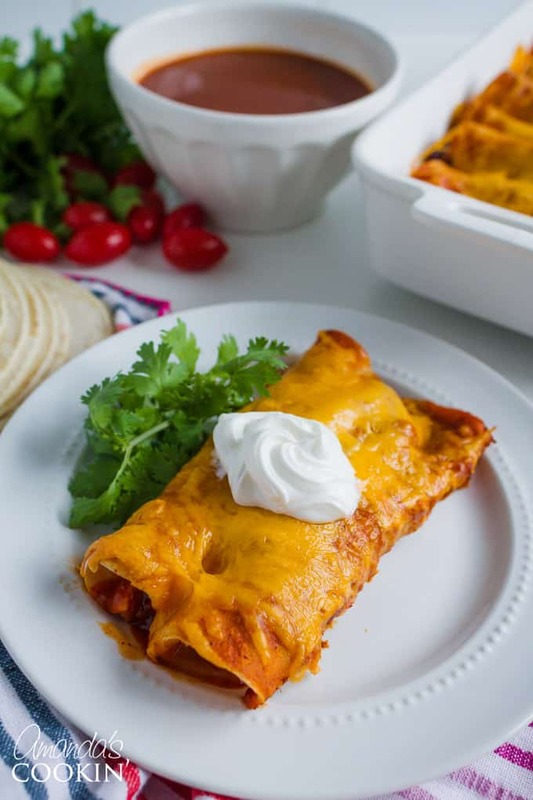 We love enchiladas in this house, whether they be beef, chicken, pork, or even vegetarian style. 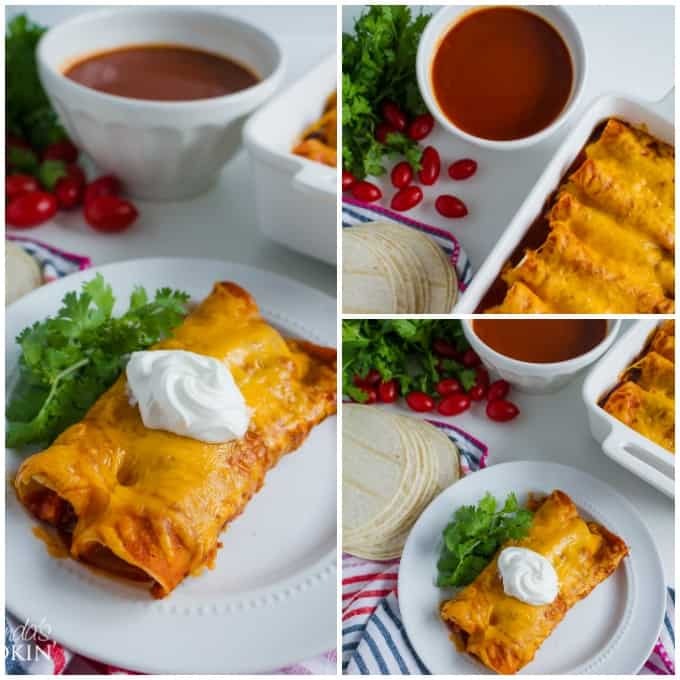 This homemade enchilada sauce is my go-to recipe for all of my enchilada dishes. These delicious enchilada stuffed peppers are a perfect example, or if you are looking for a great side dish for your enchiladas, be sure to try our homemade Spanish rice and a side of corn, mmm! I wanted to use up the beef that we currently have in our freezer, so I decided to make beef enchiladas with a round bone roast. 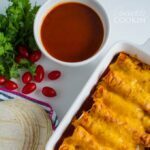 I used to buy the Old El Paso enchilada sauce that everyone knows and loves, but I had always wanted to try a recipe that is simple enough to make, but still similar. We really enjoyed the flavor of this homemade enchilada sauce and I use it all the time. you can even freeze it for later! I found the recipe in an old cookbook I had lying around, and I thought I’d tweak it a little to fit my needs. The recipe below is my adaptation. I made a double batch and froze one, the other I tossed in the crockpot with my roast. Cooked it all day, then shredded the beef. This Homemade Enchilada Sauce is full of flavor and compliments any style of enchilada- whether it be pork, chicken, beef or vegetarian style! Place all ingredients into a blender and blend until smooth. Pour into a small saucepan and bring to a boil. Reduce heat and simmer, uncovered for 5-7 minutes. 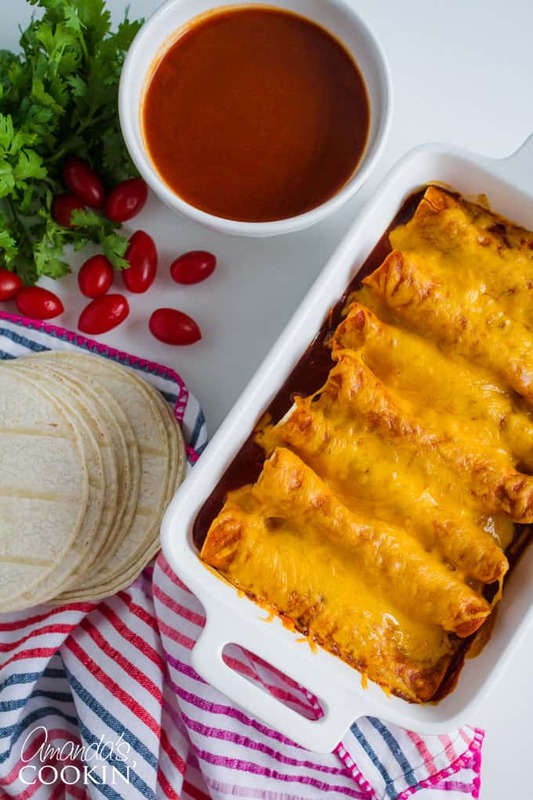 Dip each tortilla (both sides) in the enchilada sauce, fill center with beef (can use ground beef or shredded beef as I mention above or even shredded chicken or pork) and roll it up. Place it seam side down in square or rectangular baking pan and top with remaining sauce. Sprinkle with shredded cheddar and bake for 20 minutes at 350 F.
This post was originally published on this blog on Jun 10, 2009. Hope you like it Minny! Just wanted to let you know that this freezes great. I've been doubling the batch and freezing half. Gonna try this again.. it wouldn't post the first time. I am going to try this.. my hubby loves this type of stuff. I can't eat the spicy foods but I could make it for him. I've been looking all over for a good enchilada sauce. I even went as far as made sauceless enchiladas. Yours are on the list for the next round. Can't wait to try it. 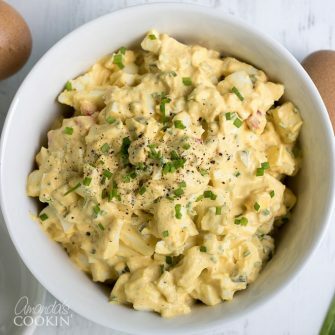 Looks delicious and super easy, too. That's a win-win in my book! Thanks for sending the photo our way! Thanks Debbie, Tami, & Blonde Duck! Barb – I still don't know if it's a money saver or not, but the flavor was great! If this works as well as the canned, I am definitely giving it a try! The cans are getting smaller and pricier. I've been dying for a good enchilada sauce! This is perfect! I can't believe you buy a whole cow! That's pretty cool! What does a whole cow cost??? Will sustitute the beef with the chicken…but love the spices in the sauce…thanks for sharing Amanda. MMM! 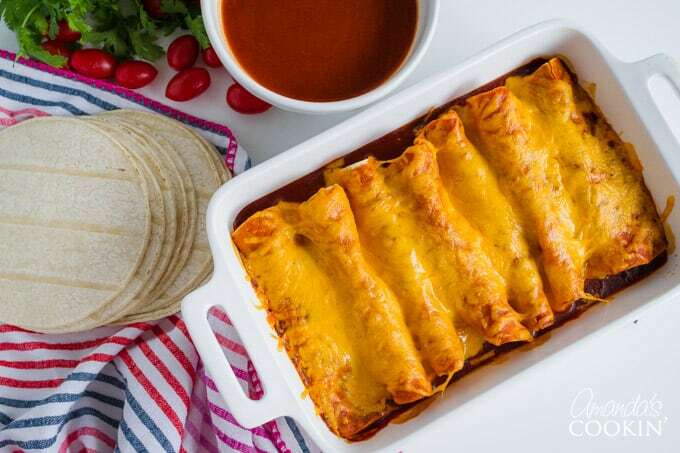 Your enchiladas look good. Homemade sauce tops bottled stuff any time! I have everything to make this Amanda, this will be dinner tomorrow. Isn't it great to have a freezer full of meat! The best thing my hubby and I ever did was buy a freezer. I love enchiladas. I am always in the mood for Mexican food. Yours looks great!